The Mystery of Horses. 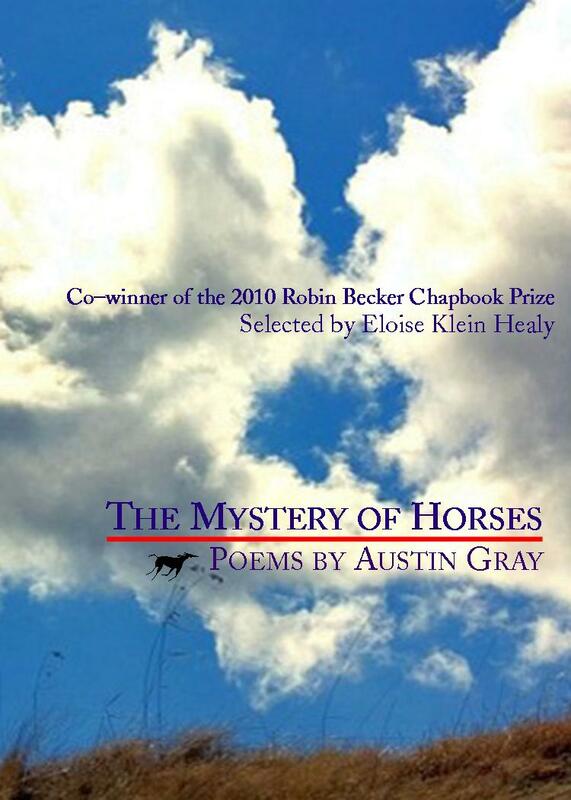 Number Six in the Robin Becker Chapbook Series, selected by guest judge Eloise Klein Healy. Having survived a New England boyhood, adolescence on a ranch in Montana, three graduate schools, a Roman Catholic monastery, and better living through chemistry, Austin Gray, a licensed professional counselor, recently retired from supervising addiction therapists at a hospital in Portland, Oregon. He live with his partner, the novelist, Henry Alley, in Eugene, Oregon. Austin’s poems have appeared in Gertrude and Envoy; a short story in Willamette Week. He earned an MFA at the University of Montana, studying under Richard Hugo, Madeline DeFrees, and William Kittredge. In a past life, he sang professionally as a tenor, for which sin he repents. the sailors shine, half-naked, sharing a bed. in jockeys, two in boxers. One frowns at a book. stroke back and forth like a swimmer. they’ll fail. The light’s too hot and lit too long. Listen. keep. I am the sulphur smell, the lit match. to heat, honing in, dive run, a zero. Please click here to purchase Austin’s chapbook.